What Kind of Market Are We Experiencing in Huntsville? All of us here at Amanda Howard Real Estate have been watching with delight as the Huntsville and Madison area housing markets have gotten back into full swing this summer. We are seeing more millennials buying homes, consumer confidence is up, and rates are hovering around 4%. 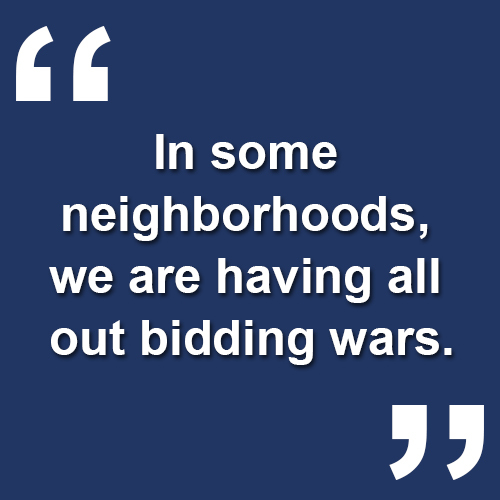 In some Huntsville neighborhoods, we are having all-out bidding wars, with multiple offers on many single-family homes. The upper-end homes are finally moving. Our office has been a part of 45% of those sales over $800,000 in the first 6 months of 2015. 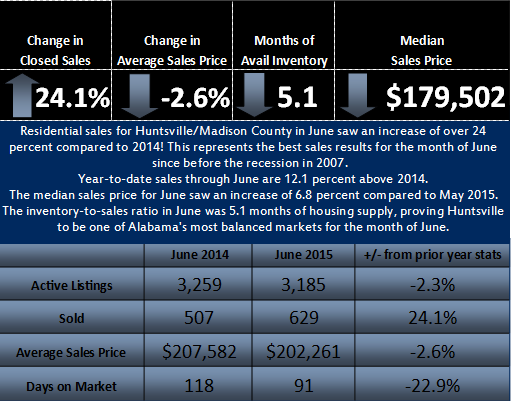 Supply is not keeping up with demand in Huntsville, and it’s not even close. This is very comforting to our sellers who need to sell at higher prices to get the equity back on their homes. If you’re curious as to what your home could be worth in a market like this, we have a great tool for you. We just purchased a new home value estimator, which you can get access to right here on our site. If you’re looking to buy, we also have access to the full MLS right here on this page. With all this being said, I have compiled the latest market report for you for June, reflecting the positive outlook I shared with you. Check it out below the article! We all need good news sometimes and I’m happy to say we have a strong Huntsville real estate market this summer. If you are in search of help or know someone looking to buy or sell, give us a call or send us an email. We would be glad to help in any way we can!